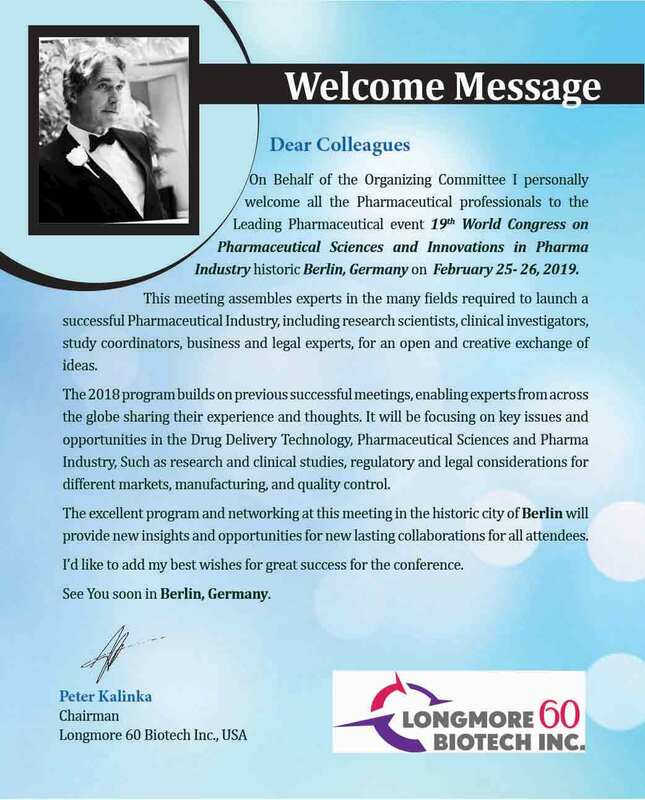 Following the tradition of successful Congresses held in several European countries, Dubai, Spain, Italy, India, South Africa and USA, the Organizing Committee of ConferenceSeries Ltd is pleased to invite all the participants across the globe to attend the 19th World Congress on Pharmaceutical Sciences and Innovations in Pharma Industry slated on February 25- 26, 2019 at Berlin, Germany. The conference is a specially organized two-day event which will provide a multi-channel communication platform that brings together both “producers” and “consumers” of pharma world of the generic sector. It includes prompt keynote presentations, Oral talks, Poster presentations and Exhibitions. It is a perfect platform for researchers, scientists and, delegates to share experience, foster collaborations across industry and academia, and evaluate emerging technologies across the globe. Young Scientist/Investigators Award geared towards best budding young research. Open panel discussions: Providing an open forum with experts from academia and business to discuss on current challenges in Pharmaceutical Sciences & Pharma Industry, where all attendees can interact with the panel followed by highly affiliated speakers. 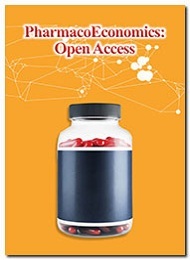 Editorial board meeting: Discussing on growth and development of Pharmacoeconomics: Open Access International Journals and recruiting board members and reviewers who can support the journal. Over 50+ organizations and international pavilions will be exhibiting at the Pharmaceutical Sciences 2019. Exhibitors will include equipment manufacturers and suppliers, systems providers, finance and investment firms, R&D companies, project developers, trade associations, and government agencies. A two day gathering that examines the future market patterns, creative business methodologies and open doors for the development of moderate medications. Pharma pioneers want the substance and roundtable examinations, yet remain for the systems administration and air. The Organizing Committee of ConferenceSeries Ltd and Pharmaceutical Sciences 2019 invites all the participants across the globe to attend the 19th World Congress on Pharmaceutical Sciences and Innovations in Pharma Industry on February 25- 26, 2019 at Berlin, Germany. 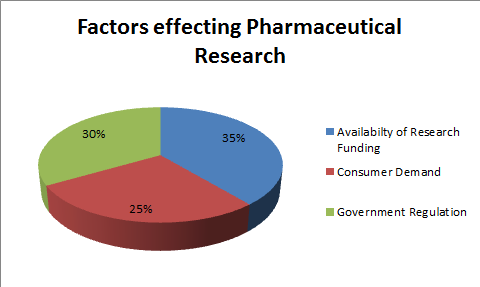 Globalized Pharma Sector is based on gaining information on changing structure of competition and increased competitiveness, lack of brand new products, despite increased investments into R&D Research and Development activities, increased importance of regulatory issues (registrations, intellectual property rights, litigations), fast consolidation and concentration of the world Pharmaceutical industry can be known as the Globalized Pharma Sector. 14th Nanomedicine and Pharmaceutical Nanotechnology Conferences, April 09-11, 2019, London, UK; 7th European Biosimilars Conference, April 26-27, 2019, Rome, Italy; 10th Pharmacology Conferences, Jul 30-Aug 01, 2019 at Barcelona, Spain; 4th Marine Drugs and Natural Products Conferences, June 11-13, 2019 at Rome, Italy; 8th Environmental Chemistry Conference, September 20-22, 2019 Berlin, Germany; 9th Pharmacovigilance Exhibition, June 21-22, 2019 at London, UK; 4th Conference on Antibiotics Conference; June 14-15, 2019, Barcelona, Spain; 13th European Pharma Conferences May 07-09, 2019 at Frankfurt, Germany. Biopharmaceutics Technology Meeting, March 19-22, 2019, Granada, Spain; Pharma dedicated packaging & drug delivery event February 07-08, 2019, Paris, France; Conference on Supply Chain Security and Management October 24-26, 2019 Berlin, Germany; World Congress of Pharmacy September 02-06, 2019, Glasgow, UK. Pharmaceutical Sciences Societies in USA: Canadian Society for Pharmaceutical Sciences (CSPS), Pharmaceutical Manufacturers Association of Canada (PMAC), American Association of Pharmacy Technicians (AAPT), American Society of Health-System Pharmacists (ASHYP). 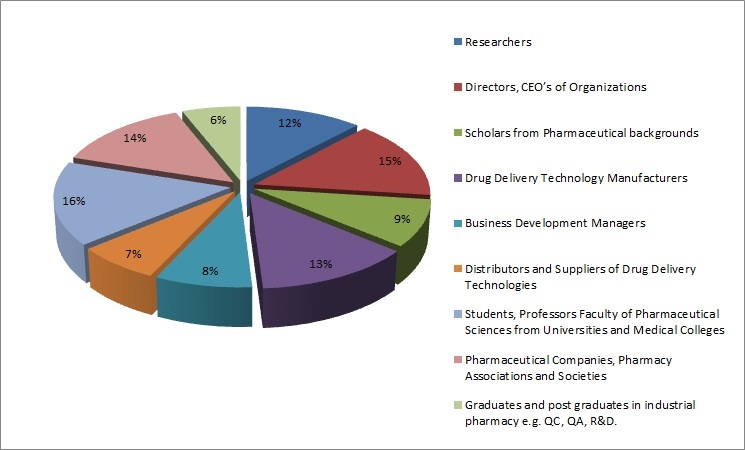 Pharmaceutical Sciences Societies in Europe: Belgian Society of Pharmaceutical Sciences (BGFW), European Federation for Pharmaceutical Sciences (EUFEPS), Italian Society for Pharmaceutical Sciences (SISF), Association of the British Pharmaceutical Industry (ABPI). In the fields of medicine, biotechnology and Pharmacology, drug discovery is the process by which new candidate medications are discovered. 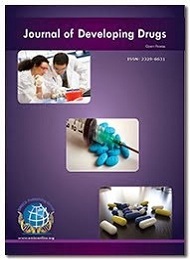 Modern drug discovery involves the identification of screening hits, medicinal chemistry and optimization of those hits to increase the affinity, selectivity (to reduce the potential of side effects), efficacy or potency, metabolic stability (to increase the half-life), and oral bioavailability. 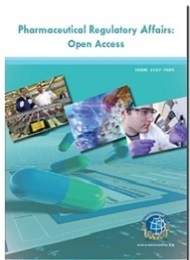 Pharmaceutical Sciences Societies in Asia and Pacific: The Pharmaceutical Society of Australia (PSA), Austrian Pharmaceutical Society (APS), Korean Research-based Pharmaceutical Industry Association (KRPIA), Kuwait Pharmaceutical Association (KPA). Drug development focusses on launch of new Pharmaceutical drug to the market once a lead compound has been identified through the process of drug discovery. It includes pre-clinical research on microorganisms and animals, filing for regulatory status, such as via the United States Food and Drug Administration for an investigational new drug to initiate clinical trials on humans, and may include the step of obtaining regulatory approval with a new drug application to market the drug. Pharmaceutical Nanotechnology deals with emerging new technologies for developing customized solutions for drug delivery systems. The drug delivery system positively impacts the rate of absorption, distribution, metabolism, and excretion of the drug or other related chemical substances in the body. In addition to this the drug delivery system also allows the drug to bind to its target receptor and influence that receptor’s signaling and activity. Pharmaceutical nanotechnology embraces applications of Nano science to pharmacy as nanomaterial and as devices like drug delivery, diagnostic, imaging and biosensor. The area unit variety of motives for extending the merchandise development outside of the mature, developed economies (e.g. the EU and therefore the US) and most of them have faith in the high population and market potential of rising markets. FDA guidance for clinical investigations and Pharmaceutical development goes a lot of and a lot of international within the direction of rising markets that tend to supply solutions for the patient achievement and overall development prices and timelines. Yet over the past decade in particular, most of the Big Pharma have adopted small molecule generics in one shape or form into their overall business model. And many of them openly talk about the “innovation headroom” that a healthy low-priced generics market enables i.e. the money saved on off-patent drugs can be used to fund high-priced new innovations. They have recognized that they cannot fight the realities of aging populations and healthcare economics. Drug absorption is set by the Drug’s chemistry properties, Formulation, and route of administration. Dosage forms (e.g. tablets, capsules, solutions), consisting of the drug and alternative ingredients, square measure developed to lean by numerous routes (e.g. oral, buccal, sublingual, rectal, parenteral, topical, inhalational). In spite of the route of administration, medicine should be in answer to be absorbed. Big pharmaceutical companies develop new business models to cope with the innovation crisis (patent loss, drying up of pipelines) and to improve their productivity in R&D and innovation. These pressures led big players to transform or reinvent their business models to sustain value creation from R&D and innovation. However, to our knowledge, there is still a lack of understanding regarding the “strategic alignment” of these organizational changes and on how they are perceived by organizational members. Some of the people believes that digital capabilities are not only critical to Pharmaceutical companies’ ability to improve the way they roll out new products, but to increasing the Pharmaceutical industry’s contribution to health care by enabling it to provide innovative services to improve patients’ outcomes. In order to increase the perceived value of Pharma within the health care system, the industry is striving to respond to the needs of all stakeholders: health care professionals, patients and payors. In the meantime, the culture of Pharmaceutical companies is shifting from one of separate departments working vertically to one that is cross functional. Packaging plays an important role in providing protection, presentation, convenience, identification information, and compliance of a product during storage, transportation, display and until the product is safely consumed. Packaging may be considered as a system by which the product safely reaches from producer to consumer. The track mainly focuses on recent advances in packaging technology and packaging material. Many types of symbols for package labeling should be nationally and internationally standardized. Packaging symbols represent product certifications, trademarks and proof of purchase. Pharmaceutical Process Validation is the most important and recognized parameters of CGMPs. Quality cannot be adequately assured by in-process and finished inspections and testing but it should be built in to the manufacturing process. These processes should be controlled in order that the finished product meets all quality specifications. Validation is one of the important steps in achieving and maintaining the quality of the final product. The requirement of process validation appears of the quality system (QS) regulation. The goal of a quality system is to consistently produce products that are fit for their intended use. Medico-Marketing focusses on exchange of drug information among drug manufacturing company and the recommending doctor, Nurse, Pharmacist or with the end user. The intention behind this data exchange is to describe the Pharmaceutical Company’s products and how it will benefit the patient community in diagnosis or management of the human ailments. The downturn in the global economy has forced Pharmaceutical and life sciences companies to focus on cost-saving initiatives, putting stress on finance departments. Although optimizing costs will always be important, reinvigorating R&D will most likely be a top strategic initiative for these companies as well. Most big Pharmaceutical companies are under competitive pressure from generic drug maker’s pressure that will become more intense as an increasing number of patents for “blockbuster” drugs expire during the next few years. Pharmaceuticals are one of the world's most beneficial ventures. In 2008 alone, the pharmaceutical business sold $773 billion in items around the world a number that has reliably developed for as long as 8 years and is anticipated to increment again by 2.5 to 3.5 percent in 2017, as per the medication statistical surveying firm IMS Health. 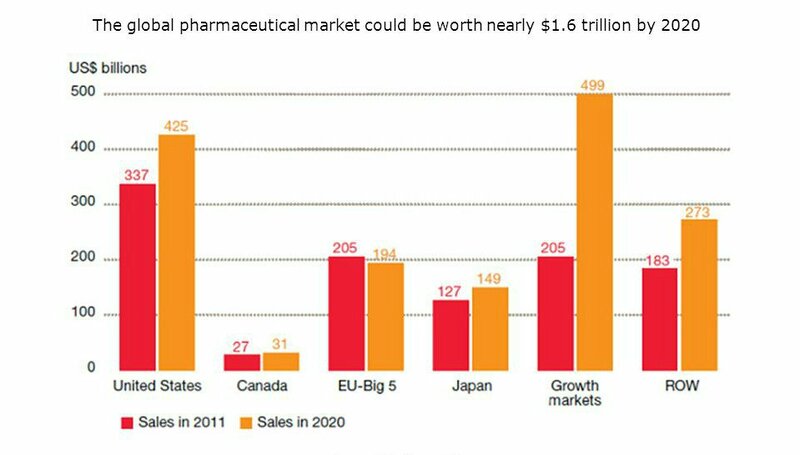 The global pharmaceutical market is growing steadily, with sales reaching $1.08 trillion in 2011 – a year-on-year increase of 7.8%. The mature economies proved very sluggish, but the growth economies were another matter. 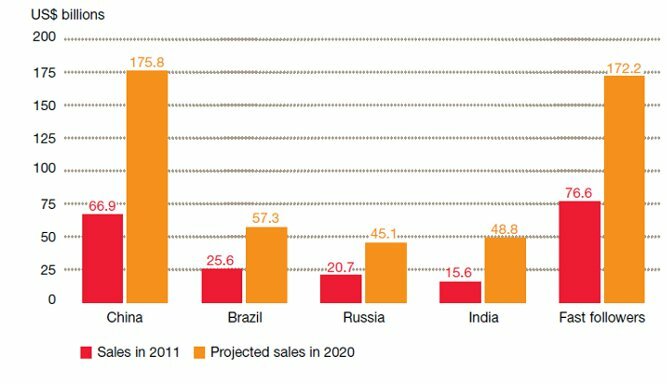 Sales in the BRIC countries (Brazil, China, India and Russia) rose by 22.6%, while sales in the other 13 growth countries (the ‘fast followers’, as we call them) rose by 7.2%.9 If this pattern continues, the market for medicines could be worth nearly $1.6 trillion by 2020. 10 Indeed, it could be worth even more. Demand for pharma’s products is rising dramatically, as the global population increases, ages and becomes more sedentary. In 2010, there were an estimated 6.9 billion people. By 2020, there will be more than 7.6 billion and if present trends are any guide, many of them will have health problems In short, there are more people – and more sick or elderly people – in the world today than ever before. More people have access to affordable healthcare than ever before. And, by 2020, access to healthcare may well be regarded everywhere as a basic human right. Take the vexed issue of the industry’s scientific productivity. Although the number of new medicines reaching market picked up in 2011, pharma’s annual output has effectively flat lined for the past 10 years. Developing new medicines is becoming an increasingly expensive business, too, although precisely how expensive is the subject of fierce debate. 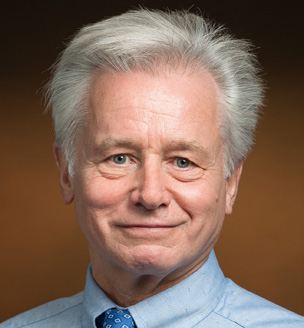 In 2006, the Tufts Center for the Study of Drug Development put average costs per molecule at $1.24-1.32 billion.22 Various commentators have since challenged these figures, claiming that the real cost is anything from $75 million to $4 billion, although most people lean towards the higher end of the range. So where does the pharma industry now stand? It’s proved remarkably resilient, given the many problems it’s dealing with. But, in essence, it faces two overarching challenges. Tomorrow’s challenge is to develop new medicines that can prevent or cure currently incurable diseases. Today’s challenge is to get to tomorrow – and that’s a tall order in itself. Fortunately, there are a number of steps senior executives can take to help their companies reach 2020 and ready them for the opportunities the next decade brings. Conference Series hosted the 12th World Congress on Pharmaceutical Sciences and Innovations in Pharma Industry at Park Inn by Radisson London Heathrow, UK during February 26-27, 2018.The conference was designed around the theme of “Latest Trends in Pharmacy : Spanning the Gap in Research and Product Commercialization” and was a great success where eminent keynote speakers from various reputed companies made their resplendent presence and addressed the gathering. Moreover, the networking sessions laid the foundation for some time worthy collaborations between many start-up and big industries. The post conference networking lunch session witnessed a number of B2B meetings that are turning up to be mutually beneficial to both the organizations who had gone in for the business meetings. Pharmaceutical Sciences 2018 witnessed an amalgamation of peerless speakers who enlightened the crowd with their knowledge and confabulated on various new-fangled topics related to the field of Pharma Industry and Pharma Sciences. This congress not only brought forward the latest developments in the field but also provided solutions to the numerous challenges encountered in developing a Pharma Industry. Conference Series would like to convey a warm gratitude to all the Honorable guests, Keynote Speakers, Delegates, Media Partners and Exhibitors for their participation in Pharmaceutical Sciences 2018. We on behalf of the conference specially thank the exhibitors for their participation in the congress and also the media partners for their wonderful marketing of the event. Conference Series also took the privilege of felicitating Pharmaceutical Sciences 2018 Organizing Committee, Keynote Speakers, Chair and Co-Chairs whose support made conference a great success. With the enormous feedback from the participants and supporters of Pharmaceutical Sciences 2017, we are glad to announce 19th World Congress on Pharmaceutical Sciences and Innovations in Pharma Industry during February 25- 26, 2019 at Berlin, Germany. I enjoyed the Pharmaceutical Sciences 2018 very much; interesting talks, nice participants and the wonderful place. I enjoyed this Congress at London. It was a good and knowledgeable experience. I enjoyed it. Everything was very well organized, and very important, members of the Conference Series were always present for support and help. I greatly appreciated this. Thank you very much again. It was my great pleasure to attend Pharmaceutical Sciences 2018. Just wanted to say thank you for the experience of presenting at Pharmaceutical Sciences conference this year. I enjoyed the whole event. Thank you again. The conference was well organized and that the opening ceremony program with Keynote lectures was very informative. I would seriously consider participating in the February 2019 meeting. Many thanks as well for organizing this very focused meetings on Pharmaceutical Innovations. Pharmaceutical Sciences congress held in London was amazing and a good experience. Thank you for a great conference in London. I had a great time, both enjoying the diverse and very interesting sessions/speakers, meeting lots of great people while also being able to see a little bit of London for the first time ever. Pharmaceutical Sciences 2018 was one of the best and even brilliant I have ever attended. There was very nice to have a mix between theory, basic science, sharing best practices and practical recommendations. The quality of the panels was outstanding, and I think you arranged a great cross-section of topics! Pharmaceutical Sciences-2018 was well organized and very well attended. The attendance exceeded the expectation. Session went on time permitting ample time for questions and answers. Doctors from all across the World attending Pharmaceutical Sciences 2018 has made this conference a successful event.